On Jan.10, two days after releasing his 27th studio album, David Bowie, 69, succumbed to an 18-month battle against liver cancer. Born David Robert Jones, Bowie was a self-described "chameleon of pop." Over the course of his 50-plus year career in music and film, Bowie reinvented himself, his sound and his image repeatedly, not just keeping up with trends, but pushing them. An inductee to both the Rock & Roll Hall of Fame and the Science Fiction and Fantasy Hall of Fame, Bowie won two Grammy's and three Brit Awards. Bowie was made a Commander of the Ordre des Arts et des Lettres by the French government in 1999, but later turned down both a CBE and knighthood when offered by Queen Elizabeth II of England. "I like crazy art and, most of the time, out-there music. Rather than having a hit song these days, I like the idea that I'm in there changing the plan of what society and culture look like, sound like. I did change things, I knew I would. It feels great, and very rewarding." - David Bowie, to Uncut magazine in 1999. Search David Bowie to find newspaper and magazine articles, biographies, audio interviews, and features. Search David Bowie for a wealth of information from short bios and reviews, to work overviews and critical essays. From scholarly papers to magazine articles, dig deeper into David Bowie. 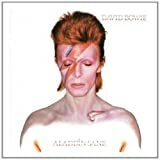 Find David Bowie's Music on Hoopla Digital Listen to Bowie's music for free with your library card. David Bowie's Top 100 Books From his own website.